I’ve been mounting “non-standard” lenses on my cameras for years. Ever since I discovered that I could put M42 lenses on Nikon and Canon bodies I was hooked. Many older lenses offer a look and feeling that you simply can’t get with more modern “perfect” glass. But deciphering photographs on the computer by searching through EXIF isn’t easy, because such lenses don’t communicate with the camera, so don’t store that lens information. 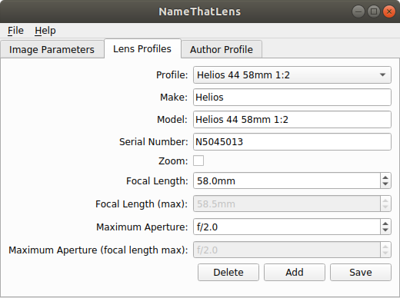 This new cross-platform app, NameThatLens by Georg Fiedler wants to help solve that problem by allowing you to inject custom lens metadata into your images through a nice cross-platform graphical interface. Georg says he became frustrated with existing options. He discovered the LensTagger plugin for Lightroom, but this doesn’t help for everybody as it only works in Lightroom. If you use Capture One, Darktable, or something else, you’re out of luck. So, Georg developed his own tool, which is completely app independent as it injects the data straight into the file. 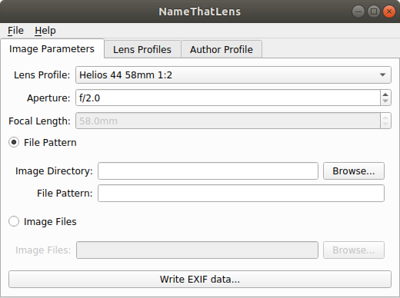 In its current form, says Georg, NameThatLens is essentially a GUI wrapper for the free software ExifTool. ExifTool is quite powerful, but it’s a command line app, so not very intuitive. The NameThatLens GUI makes it a breeze. In the app, you add profiles for each of your lenses. It understands the difference between primes and zooms, and you can even enter a lens serial number (handy if you have multiple copies of a lens). The next step of the process, once you’ve created the profile for your lens is to set up the specific parameters for your images. Here, all you need to do is select your previously added lens from the dropdown list, choose your aperture and then write the EXIF data out to the images. You can do an individual image, or batch multiple images based on a filename pattern. I say “all you need to do”, but this could become quite challenging if you’re not taking notes for each of your shots. If you’re adjusting the aperture throughout a session, or you’re using a zoom and regularly adjusting your focal length, it’s easy to lose track. But beyond searching for images shot with a particular lens, why might you possibly want to add the lens to your EXIF data? Well, If you are a Lightroom or Adobe Camera Raw user, you can create your own custom lens profiles using the Adobe Lens Profile Creator. This tool allows you to profile your lens for things like vignetting, distortion, and other optical aberrations. Having the lens tagged in each of your images means you can automatically apply these corrections when you bring an image up in LR/ACR. This could save you a lot of time in post over the course of hundreds or thousands of images shot with a particular lens. The app is available for Windows, Mac and Linux. Officially, the app is in the “Alpha” stage of its development, and Georg has only tested with it JPG, ARW, ORF and RAF files, but in theory, it should happily support any file format that ExifTool does, and that list is extensive. If you’re a weird lens fanatic, this could be just the tool you need!